I must confess. I have not been very productive this last month in the Duck of Minerva. I have been thinking about the topic for my next post and postponing it “till tomorrow”. I have been procrastinating. Procrastination comes from the Latin pro, meaning “forward, forth, or in favor of,” and crastinus, meaning “of tomorrow”. The Oxford English Dictionary defines procrastination as a postponement, “often with the sense of deferring though indecision, when early action would have been preferable,” or as “defer[ing] action, especially without good reason.” According to psychologist Pychyl, procrastination is fundamentally a visceral, emotional reaction to what you have to do and that you consider hard, boring or overwhelming. One of the most common procrastinators in academia is the internet addict type. Academics can spend countless hours on Twitter or on Facebook groups where news articles marginally related to their research are posted. Academics are so addicted to social media that you can see them frantically typing on their smartphones at conferences, exchanging on Twitter with the person that is sitting right next to them in that panel. Granted, social media can be a very powerful tool for networking, being part of the latest debates and making sure you just don’t miss any bit of work that has been published on your area. However, it is also one of the most disruptive and addictive instruments ever invented. What is more, according to a study by Ward et al. from the University of Texas, the mere presence of smartphones in our lives reduces our brainpower and makes us dumber. Constantly checking your smartphone, or the internet for that matter, is making you lose the focus and concentration needed to get intellectual work done. I get it. Writing, structuring your thoughts and critical thinking are hard. “Let me just check this reference” or “just 5 minutes on Twitter”. Rationalizations are at the heart of procrastination. We rationalise and justify our behaviour with logical reasons, even if these are not appropriate: “I need to feel like doing it” or “I need a deadline/I work better under pressure”…. Or by telling ourselves things such as “I’ll do it tomorrow”. Pychyl argues that there is a common misconception about goal pursuit: We believe we actually have to feel like it. But we won’t. And the problem is that, such as with many other tasks in our lives, we won’t feel like it… ever! Therefore, we would be better off if we let go of the misconception that our motivational state must match the task at hand. We discount future rewards of getting the task done in relation to short-term rewards of feeling good right now by checking that facebook status or that Tweet. Planning fallacy: we underestimate time things will take to do and overestimate how much we can do. Do you remember that whole list of things you were planning to do over the summer that are now on you Christmas break “to do list”? Just get started: The idea is to divide and conquer. Once you start with a task, it is rarely as bad as we think it would be. Getting started therefore changes our perception of the task and of ourselves. I propose using the implementation-intention tool. Pick a task or goal that’s bothering you. Write down as many subtasks that you can think of that are required to get done. Keep them as simple and as concrete as possible. Pick one of these subtasks and write down when, where and how you are going to do it. Just get started with the first subtask and focus only on accomplishing that subtask. Once you have finished it, reward yourself with some internet procrastination for a set amount of time. Because sometimes drastic measures are needed, here you have some useful blocking devices. Ferrari, J. R. 2010. 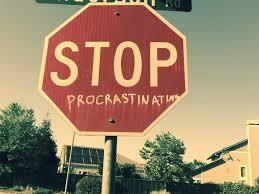 Still Procrastinating? The No Regrets Guide to Getting it Done. Hoboken, NJ: Wiley. Pychyl, T. A. 2013. Solving the procrastination puzzle. Tarcher.